Henley Rowing Club scored a dozen wins on during challenging weather conditions at the annual Henley Town and Visitors Regatta on Saturday. Taking the Victor Ludorum trophy in their 175th Anniversary year, the victories were a fitting end to a superb season for the local club. During a day of racing through rounds and semi-finals, the Henley club used their knowledge of home water over the 800m course to combat the gusting head wind and intermittent downpours. The junior mens squad won in three events, beating Stratford upon Avon Boat Club easily in the J15 double sculls, taking a quarter length win against Reading Rowing Club in the IM3 coxed four, and a magnificent win by a third of a length in the IM3 eight against Twickenham Rowing Club. 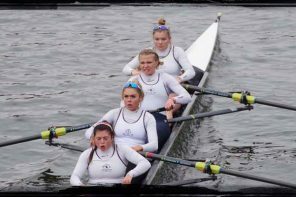 The senior and junior women’s squads joined forces in the IM2 coxed four, with mother and daughter Catriona and Lauren Kay racing together for the first time with Rachel Adler, Maisie Turner and cox Zoe Thomas. Their commanding four and a half length win against Northwich Rowing Club was a highlight of the day for the club, and gave daughter Lauren Kay her second prize of the day following her victory against a visiting sculler from Henley’s twin town Bled in the IM3 single sculls. 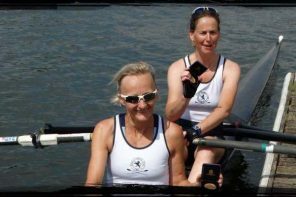 The women’s senior double of Lizzie Williams and Victoria Carver battled with local scullers from Upper Thames Boat Club over the 800m course to win by a single foot in one of the closest races of the day. 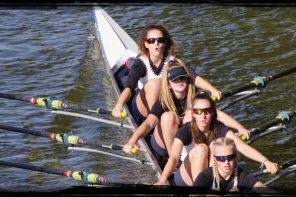 Girls from across the age groups in the junior women’s squad raced together in an eight to beat Green Templeton Boat Club and Barnes Bridge Ladies Rowing Club in women’s IM3 event. The crew of Ioan McNab, Lily Stimpson, Alicia Redman, Ella Wandless, Emily Pimlott, Alexis Perkins, Ella Morgan, Emma Lister and cox Rebecca Lister took an early advantage over the short course and raced to a one and two-third lengths victory. Ciara Buckley and Ellie Thompson won the junior women’s double easily against Stratford, and a similar victory was demonstrated by Georgina Robinson Ranger in the WJ14 single sculls against Stratford again. This was repeated in the WJ14 double sculls with a further win against Stratford. Buckley then went on to win with a five length victory against scullers from HSBC and Ardingly Rowing Clubs in the women’s novice sculls. The women’s J15 double sculls was an all-Henley RC final, with the crew of Katy Claridge and Clare Pearson taking a victory against fellow club mates Ella Morgan and Lily Stimpson.